I have an addiction to reality TV, one that's strong enough to rival my fitness obsession. And not just of The Biggest Loser variety--which, I might add, has sucked me into its evil vortex once again where I don't want to miss a week and I cheer for Ada as I did for Tara in season 7. I found a sporty bunch of Survivors vying for that ultimate Survivor title in Nicaragua. I had my picks for The Apprentice (let's see how that unfolds this week), and I drooled over desserts post-workout for Top Chef: Just Desserts. But tonight unveils one premiere I've been waiting for for weeks. Not just because the foodie in me wants to catch up with the Top Chef alums who fell just short of the top prize, but also because a few of my all-time favorites are returning to the kitchen in Top Chef All Stars. Call me a sucker for the Chicagoans cooking in the kitchen like Dale Talde, who helped open Vong here at home but now lives in New York, and Dale Levitski, who waited tables at Sola between his season 3 and the live finale and now mans the kitchen to rave reviews at Sprout. But a running chef? Sorry Dale and Dale, but Carla Hall wins out in my book. I can't wait to watch her in the kitchen this season after growing to love her last time around in season 5. So when I had the chance to interview her earlier this year, I was all too excited but saved the reveal until now. Kate: During Top Chef, you candidly equated the competition to being like a marathon, which tipped me off that you might be a runner. How did you get into running? Carla: I joined a running group with a friend to be her workout partner for a 10K. I honestly didn't think she would last, but several races and two years later I was entering a marathon. K: What do you like about running marathons? C: I enjoyed the personal challenge. Each workout pushed me. The rush, however, was finishing in a better time than expected. K: I heard that you ran the Paris Marathon for your 40th birthday and had a unique experience from the race. Would you mind sharing that? C: My mom and a couple of friends had scheduled a visit to Paris at the same time as the marathon. This being my mom's first experience as a race spectator, I had to school her on cheering, standing at an agreed upon place, and how to hand off my fresh water bottle. There was no mom at the first spot, the five-mile mark. I was crushed. I admit I shed a couple of tears. I needed and wanted my mama. The second spot came and went--the 21st mile marker. I wasn't as crushed this time. Perhaps my mom was wrapped up in a French experience. At mile 22, I see her on the left side of the street--I was on the right--waving her arms and yelling for me. I threw my arms up as if to say "I can't get my water bottle from there. "...Just seeing her was great, but I kept on running. The next thing I knew, I heard these quick footsteps behind me and the faint calling of my name. It was my mom! She was now running in the race and her coat was flying out like a Batman cape. She was determined to get me the water bottle. She finally caught up with me and I stopped and hugged her. It was the best! The other spectators cracked up, but that one gesture was fuel for my soul. I soared through the next few miles like it was the first. There's nothing like a mother's love. K: How do you juggle your catering business, being a Top Chef star, spending time with your family and staying fit? C: I have to admit it's hard, and I'm not always successful. Sometimes a workout is taking several flights of steps instead of the elevator or a few sun salutes first thing in the morning. K: Are you still able to keep up with running? Where are your favorite spots to run, especially in the metro D.C. area? C: The running has slacked off, but it's one of my fitness goals for 2010. My favorite place to run is along the C&O Canal. K: I read that you practice yoga. How did you become interested in it and have you found that it helps you in the kitchen? C: Yoga is an excellent practice for centering yourself and strengthening your center for correct posture. I spend most of the day prepping and standing over a table with rounded shoulders. If I don't constantly correct my posture, my back screams at me the next few days. K: What's your favorite post-workout snack or meal? C: Clif bar, apple and an energy drink. K: Do you have any fitness goals for 2010? C: No marathons in the forecast, but I would like to run a 10-miler. And I'm sure win Top Chef All Stars would be a goal too had I asked. Now here's to cooking in the kitchen--I just hope Carla can surprise us all like she did the last time around. And maybe provide a few running analogies in the process. 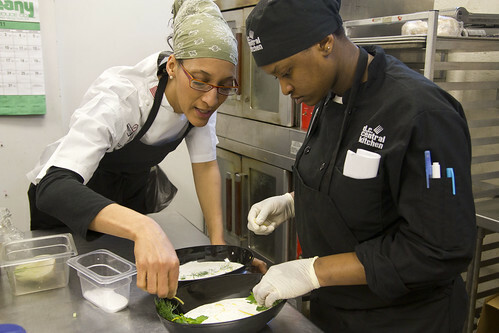 Follow Carla at her website carlahall.com and stay tuned to Bravo on Wednesday nights for the latest season of Top Chef at 10 p.m., 9 p.m. central. Photo grabbed from DC Central Kitchen at flickr. Thanks for reading and hope you enjoyed! Let's see how Carla cooks in the kitchen this week! My roommates and I think Carla looks like a bird. Squaw! Oh geez! I guess I can see where that's coming from...I still love watching her on Top Chef. Have you been watching All-Stars?